It may not be getting the same level of media attention as a certain darling from Apple, but there are a good number of people who are seriously interested in BlackBerry Bold phones. This new handset is supposed to completely revolutionize the BlackBerry brand, while still maintaining many of the features that you know and love. In many respects, you could say that BlackBerry Bold phones are the spiritual successors to the Blackberry Curve line of handsets from Research in Motion. Many of the early BlackBerry devices had a very corporate and enterprise slant to them, but with the introduction of products like the BlackBerry Pearl, it's clear that RIM wants a bigger slice of the consumer pie. The BlackBerry Bold 9000 is still largely a business-oriented device, but that doesn't mean that it has to look boring and utilitarian. In fact, the BlackBerry Bold phones could be the most aesthetically attractive BlackBerry phones to date! The features aren't anything to sneeze at either. In terms of connectivity, users gain access to quad-band GSM, tri-band HSDPA, integrated WiFi, and stereo Bluetooth 2.0, as well as built-in GPS with BlackBerry maps. With all of these wireless radios, users will also have a way to stay connected with the office (and with the world). The HSDPA connection is rated at up to 3.6Mbps, but a firmware upgrade may be able to bump the maximum throughput to 7.2Mbps. 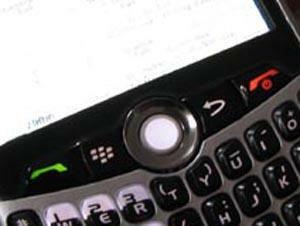 The BlackBerry Bold is also said to boast an all-new BlackBerry operating system. Taking on a very slick appearance not unlike the iPhone and Samsung Instinct, the Bold operating system is much more pleasing to the eye than previous offerings from Research in Motion, makers of the BlackBerry family of devices. The sleek QWERTY keyboard is highly attractive as well. Other notable features include trackball navigation, microSD expansion slot (support up to 8GB cards), 1GB internal memory, 624 MHz processor, media player, video player, organizer, calculator, and DataViz document viewer/editor. You also have the ability to install additional smartphone software, just like on other BlackBerry phones. Just like the Apple iPhone 3G, BlackBerry Bold phones are perfectly capable of playing games and running a series of different applications. Both devices will serve you just fine when it comes to basic functions like phone calls, web surfing, and mobile email. There are obviously differences between the Bold and the second generation iPhone as well. For starters, the Bold is equipped with a full QWERTY keyboard, whereas the iPhone has an on-screen virtual keyboard. This is largely a matter of personal preference, but traditional users will likely appreciate the physical QWERTY of the Bold over the touchscreen of the iPhone. That said, the Bold does not have a touchscreen at all, offering menu navigation through the trackball instead. This is the same as you'd find on the Curve and the Pearl. It is difficult to determine exactly which is the better phone, because it depends largely on the needs of the individual user. The BlackBerry Bold is geared more toward corporate users, whereas the iPhone 3G is better suited as a lifestyle device for tech-savvy consumers. The Bold perhaps has more productivity tools, whereas the iPhone 3G has more multimedia functionality. Both BlackBerry Bold phones and the iPhone 3G are solid choices. Where Can I Buy the Bold? In North America, the BlackBerry Bold 9000 will be available through two major service providers, one for Canada and one for the United States. In Canada, you will find the BlackBerry Bold on sale through Rogers Wireless. At launch, the pricing was set at $399 with a three-year contract. Rogers also requires a minimum monthly plan of $45. This is substantially more expensive than the iPhone 3G. In the United States, AT&T will be the exclusive carrier of the BlackBerry Bold, at least initially. Pricing had not yet been announced at the time this article was written, but it should be slightly lower than the pricing in Canada. Even if it is the same, Americans will not have to deal with the three-year contract that Rogers takes.